Last year Anastasia, aka Acid Pop Tart, ordered several of our Baby Soda Bottles, Test Tubes and more for her Bride of Frankenstein costume. 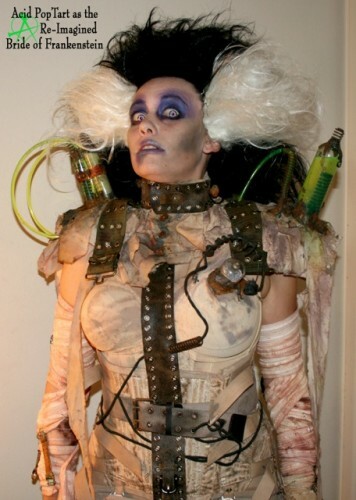 To say she built the extremely original costume is an understatement. We are happy to share that Acid PopTart won first place in a few contests, but didn’t win enough to cover the cost of the costume. 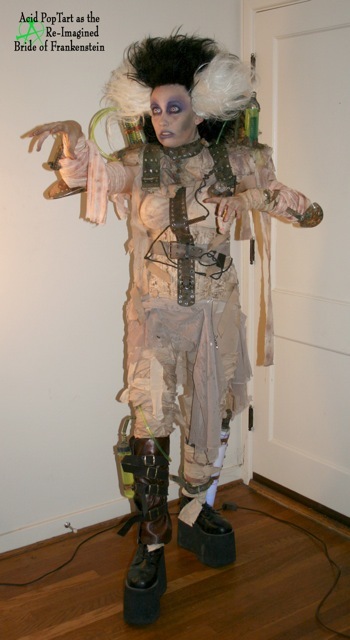 Anatasia made the costume from salvaged materials, like a vintage medical corset and various bolts, wiring and 1950’s vacuum tube. She hand-dyed everything and created rusted metal parts with hot glue, iron paint primer and antiquing solutions. This is one serious Halloween fan. She also used a lot of test tubes. They were placed on her shoulders with glowing liquids and held in place with wire coils and tubing. They contained green, glowing liquid that sloshed around as she walked. I needed something air tight, but that I could empty out and refill as needed. Those test tubes SAVED me! They were perfect. A test tube was also attached to her leg with wire coils and tubing to look like a power supply. We hear Acid PopTart is already working on a carnival-themed haunted funhouse for this Halloween. We can’t wait to see what she dresses up as this year. What are you dressing up as this Halloween? If you have an amazing science-themed costume, please share it with us via our Facebook or Twitter channels. We may just share it with our readers. Thank you Steve Spangler science! You’re never too old to learn something new. I’m constantly looking for new uses for items but I was stumped when it came time to bring my costume sketches to life. Frankenstein’s monster represents so much to me, I felt when it came to bringing my version to life, I wanted to show off some of the life giving elements such as the eerie glowing liquid in the test tubes mounted on my shoulders. I could have taken glow sticks and tossed them in some container sure, but it didn’t give the same effect and didn’t feel real. Spangler science truly saved me, the worse wardrobe malfunction would have been that glow liquid spilling all over my hours of work! Those soda bottles were PERFECT, just the right size and air tight so I could mount them upside down. Plus the plethora of glowing and black light reactive items at your site gave my costume some pow! Science rocks!